Locals will tell you that for six months of the year the lakes are in Fermanagh, and for the other six, Fermanagh is in the lakes. Rain sweeps in quickly in this small corner of Ulster. Waters rise and landscapes change. Frontiers are always on the move and borders once thought traversable can suddenly become treacherous and even deadly. This landscape is therefore an apt backdrop to the new 1880s-set drama Death and Nightingales which began on BBC2 on Wednesday, 28 November. The story is rife with division – class, religion, politics, affection – but the lines separating the characters are not always clear; much like the glistening, reed-ringed county where lake meets land. That which divides also connects. Based on the book of the same name by Eugene McCabe, the story is that of Beth (played by Ann Skelly) and her relationship with her stepfather, Billy Winters (Matthew Rhys), a wealthy quarry owner, and a local tenant farmer and labourer called Liam Ward (depicted by Jamie Dornan), a man with secrets of his own. This is Ireland in 1885, a land not yet divided between north and south but one of real upheaval. This is the time of Parnell and the push for Home Rule, the time of the Land War, evictions, and landlordism. Memories of the Great Hunger are all too clear. It transpires that it is Beth’s birthday and what slowly unfurls, through a series of flashbacks, gives us a glimpse into why she is considering flight from her seemingly comfortable life and family home. Her stepfather is troubled man, a Protestant landowner who married Beth’s Catholic mother, crossing all societal lines, only to discover that she was pregnant with another man’s child. Their marriage is fraught. Her mother is angry at Winters’ ownership over her family’s ancient tribal estates while he inflicts mental (if not worse) abuse upon his wife for her indiscretion leading to Beth’s birth. Young Beth’s affections are another front upon which her parents’ fight is conducted. Winters appeals to Beth’s greed, saying that if she “plays her part” she might yet inherit his great wealth. When his wife dies Winters begins to behave in increasingly “unfatherly” ways towards Beth and she is not alone in wondering what part he has in mind for her. Yet she does not know if she loves or hates Winters, or if she will follow through with her ultimatum and depart from her home and his controlling influence. Matters are further confused by Beth’s seeming infatuation with Liam Ward. A year before, they had met for the first time and had together attempted (unsuccessfully) to rescue a bull caught in bogland (a second rescue of a cow whose life is in the balance is by Beth alone and results in its recovery – metaphors and foreshadowing are rarely far away in this story). Ward and Beth soon meet and agree to go to an island that had been owned by her mother. There, he tells her of his belief that Winters is a spy, an accusation which she laughs off. His prejudice against Winters is all too apparent. If there is a line that is defiantly crossed in episode one it is when Beth beds Ward. Afterwards, she tells him of her desire to make Winters suffer and of her cruel stepfather’s stash of gold. Ward comes up with a plan to steal this wealth and possibly even kill Winters before making off with Beth to start a new life “over the water” in America. The viewer is left to wonder who is playing who in this dark, intriguing tale. Is the writer playing with our perceptions of the politics of the day? Things are certainly not as they seem in this bleak world filled with characters acting in often contradictory ways. The performances are fine, the script perhaps a little better than the capability of those playing the leading roles, but it is not really to the detriment of the overall piece; brooding and mumbling is to the fore here. Matthew Rhys’s Winters is the standout. He imbues the main antagonist with depth and a modicum of humanity to evoke sympathy, all the more impressive given the Welshman’s assumption of a convincing Ulster accent. Hopefully the delivery in this twang will be comprehended by audiences across the water. All in all this is a solid first outing with much to encourage viewers to tune in for the final two episodes. 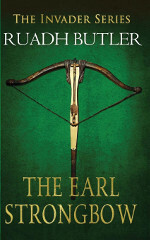 Ruadh Butler is the author of Swordland, Lord of the Sea Castle and The Earl Strongbow. His grandfather was manager of the National Trust property at Springhill in County Londonderry which doubled as the Winters’ home in Death and Nightingales.